Disclaimer: I am not a medical professional. This advice is based on my experience as a mother and from the advice given to me by my children’s pediatrician. Please contact your pediatrician or dial 911 if your baby cannot breathe, is lethargic or if you believe he/she is facing a medical emergency. It’s that time of year again! Cold season! It’s one of the most dreaded times of the year if you have little ones because there is nothing worse than trying to wipe a child’s chafed, running nose. They hate it! My little ones have been suffering with colds this week, and it’s been nothing short of dramatic. Their noses run constantly. Their skin around their noses and cheeks are chafed from all of the wiping. They’re snoring uncontrollably during sleep because of congestion. They’re sneezing huge snot bubbles, and their appetites are suppressed. I know I’m not the only mommy who’s helping her little ones get through a nasty cold. So, I’ve decided to create a list of five things you can do right now to help your little ones endure the nasty cold virus. Winter time is awful for a cold because the air in the house can be extremely dry if you have a fireplace or if your heat is turned up. Dry air can make for very uncomfortable breathing for little ones, especially at night. That’s why every parent must have a humidifier. The cool midst humidifiers add moisture back into the air to help little ones breathe easier and the hot-air humidifiers greatly help clear the mucus out of stuffy noses. You can find both kinds of humidifiers in your local pharmacy or grocery store or at stores like Target. I really like this tip because it is easy, and you can let your little ones run around if your bathroom is big enough. 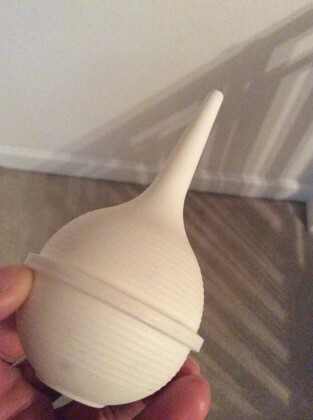 Create your own steam room in your bathroom to help break up the mucus in the chest and nose. Turn the water on extra hot, and run the shower for a few minutes until the room is filled with steam. Once the room is extra steamy, allow your little ones to sit or play in the bathroom for a little while. You’ll be surprised at how fast the mucus runs out of their noses and breaks up in their chests. My kids hate this, and my doctor advises against using it! My little ones don’t really have appetites when they are sick, so I make sure to give them lots of fluids to prevent dehydration. If your little one is at least 1 year old, you can give him/her warm, decaffeinated tea with honey (Doctors warn not to give honey to babies under 1 year). If you’re creative, you can even find a way to give them warm broth or soup. This will help their cough and sore throat. If your little one really doesn’t feel well, it will be easy to make them lay down and take a nap. However, if your child still feels well enough to play, you’re going to have to make them get plenty of rest during the day. Your pediatrician will tell you that there isn’t much they can do for cold viruses. There isn’t any cold medicine for infants. Rest will help their body’s immune system kick in to overcome the virus. It is the worst to see your baby or toddler suffering with a cold, especially because they don’t know how to blow their nose or cough up the mucus in their chest, so be very patient and give your little one lots of love and hugs. Since there isn’t much doctors can do for a virus, it’s up to us as parents to make our little ones as comfortable as possible while their bodies fight off the virus. If you’re not sure if your baby has a cold or something more serious, here is great article on what signs to look for when determining if you need to go to the emergency room. Click here. 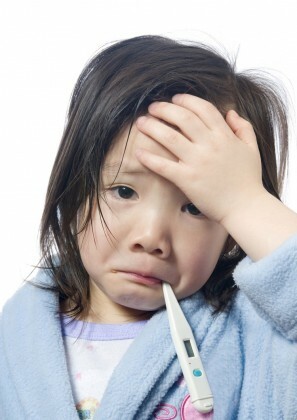 How do you help your little ones endure a cold? Please share your advice in the comments section!